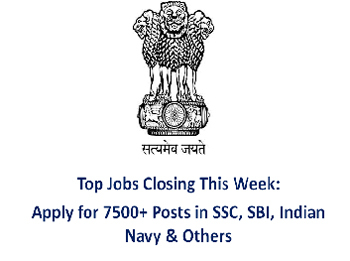 Top Jobs Closing by 21 May: 2860 Vacancies in UPSC, India Post, Indian Navy, Police, etc. More than 2860 Govt Jobs are closing by 21 May that entails some very crucial job posts under reputed government organizations. India Post, Indian Navy, WBPSC, UPSC, West Bengal Police and some other organizations are in the list of notifications that will end this week. Candidates preparing for government jobs should get through these notifications listed below and apply soon. Around 7500+ job notifications are expiring this week that entails some very crucial job posts under reputed government organizations. SSC, SBI, Indian Navy, WBPSC, HAL, MPSC, Indian Post, UPSC, West Bengal Police and some other organizations are in the list of notifications that will end this week. Willing candidates need to check the post they are applying for along with the organization and last date. As all the jobs enlisted below will expire in coming few days, so aspirants need to keep checking the last date before applying for any job. The posts to be applied are Nursing Officer, Trade Apprentice, Veterinary Assistant Surgeon, SI, ASI Posts, Conductor, Sub Inspector, Senior Resident, Gram Dak Sevak and some more. Some important organizations will conduct examinations as well -WBPSC Audit and Accounts Service Recruitment Examination 2017 and UPSC Combined Medical Services Examination 2017. The major job post is issued by SSC to fill up 2221 SI, ASI Posts in CAPFs and Delhi Police. The last date to apply for this job vacancy is today, i.e,. 15 May 2017. The other important notification is by State Bank of India to hire Special Management Executives. A total of 554 SME will be appointed and the last date to apply for it is 18 May 2017. Get to know about all the job posts ending this week through the links pasted below.